â€¦my focus should have been on unoriginality, stupidity, and predictability of my targets. Itâ€™s not that Iâ€™m really â€œoffended.â€ Itâ€™s just moronic and tired. 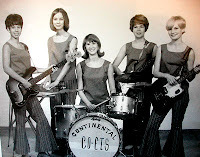 THE CONTINENTAL CO-ETS are one of dozens upon dozens of lost American garage treasures who surfaced during a brief British Invasion- and “Psychotic Reaction”-fueled rage of loud guitars, short songs, and bouncy choruses. But get this â€“ they were girls. Thereâ€™s that whole forgotten underbelly of all-girl or girl-led bands from 1964-67, celebrated on the GIRLS IN THE GARAGE compilations and perhaps best known and represented by the single track, â€œWhat A Way To Dieâ€, by Leather Tuscaderoâ€™s PLEASURE SEEKERS. A few years ago I got wind of a couple of fantastic lost 45s by this Minnesota band, one of which had thankfully been repressed by Get Hip records. The other tracks are scattered among various hard-to-find compilation LPs and CDs. The Co-Ets have a really great, brooding, minor-key chug to their songs, with terrific young-girl vocals and choruses that itâ€™s hard to excavate from your head once they get lodged in there. My favorite 2 of their 4 are the ones Iâ€™m posting for you here. Â Â Â Â For all fans of â€œmumblecoreâ€ and Miranda July, itâ€™s time to see how a real movie is made. The Assassination of Jesse James will be my number one movie of the year. I also recently viewed Straight Time on DVD for the first time, though that stands as what may be my 33rd time to watch it. Worth it for the short Edward Bunker/making-of documentary alone, this was also one of the only instances in which Iâ€™ve endured the commentary option. Dustin Hoffman and Ulu Grosbard fire off loose but fascinating facts about this overlooked classic. Then thereâ€™s Mamet. You are reading the unfocused ramblings of a David Mamet fanatic, and he is now mentioned because, at this very moment, Iâ€™m watching House of Games. Â Â Â Â This all-around level of quality causes me to further dismiss theÂ indie genreÂ and especially theÂ â€mumblecoreâ€Â idiocy that resides under its umbrella. I recently attended a local film festival, and â€œindieâ€ film festival,Â in which I viewed a couple of films thatÂ disturbed me to the core with ineptitude, lack of meaning, lack of talent, and a troublesome dearth of original ideas. One of these films won. Executing a script in which nothing happens, something intentional and done with pride, is not an admiral feat. Supporters and practitioners of Mumblecore need to disappear if films, films as a whole, are to move in decent direction. Â Â Â This being a Southern film festival that I experienced, there was the requisite yet infuriating degree of slumming. I have no time for morons dressed up like rednecks, country-sounding pseudonyms, or any other example of Southern exploitation carried out byÂ hipsters unfamiliar with rural existences. Iâ€™m a little regionally protective, thus naturally appalled by this type of crap. Another problem with these films (and their makers) is the calculated ignorance and dignified Luddite drive. People that make films should watch films. They should also watch TV. A paltry frame of reference is not beneficial or something to be proud of. It makes you what you are: Illiterate in your field. Many of these filmmakers like to state this bit of applesauce: â€œI make movies for myself, not for other people.â€ Iâ€™ll leave you with that bit of nonsense. Author kimPosted on October 31, 2007 Categories Andrew EarlesLeave a comment on Listen Up, Dimwits!!! Oh my godâ€¦ Oh my godâ€¦Those were not only the last words uttered by Princess Diana at the back of a Mercedes, but the only words I could muster on first hearing this full-blown-no-doubts-about-it MASTERPIECE. Itâ€™s just so incredible and undeniably perfect, that I just canâ€™t get this stupid grin off my face. If youâ€™re not immediately hooked by those weird slowed-down intro vocal effects, the loud and I mean LOUD guitars, the thumping beat, the mother of all catchy tunes, the inane lyrics, youâ€™re reading the wrong Blog. This is like Pantherman in a monkey suit running Jungle Jim out of town. Douglas Westlunds was in fact the drummer on some weekly Swedish TV show , but one night he stepped up to the mic and performed this number. Sweden went nuts, the phone system melted and he was offered a contract to release the song on the spot. 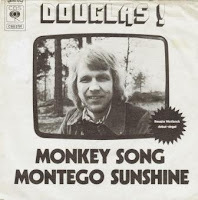 It became a semi-hit, and as far as I know Douglas wasnâ€™t heard from again. I would love to hear different thoughâ€¦Credit where credit is due. The superb loud production is by Mats Olsson and Monkey Song is written by Jorgen Larsen. BTW, as expected, the B side is not worth throwing or waving your banana at. Some interesting developments around here which’ll have to wait until around the end of the week to be revealed (mais, hÃ©las, pas des nouvelles de France), but a couple of things in the meanwhile. A bunch of you may have gotten invitations from me to join Shelfari, a new online community/social networking site devoted to reading. A whole bunch of you, in fact. I apparently sent out about a thousand invites to all my “friends” in my gmail address book. I’m happy to say I’m not the only one, since this poor guy got caught before I did and wrote a nicely humorous piece about it. What’s even worse is that at least 50 of these people have accepted “my” invitation, and Shelfari makes it almost impossible to figure out who they are. Very few of them are people I correspond with regularly — or even remember. It doesn’t help that I get an e-mail from Shelfari headed “Bill F has accepted your invitation,” because that’s how people are listed there. Bill F? The worst was Park S, which has me awake at night fearing that I’ve befriended the entire population of Park Slope, Brooklyn. Speaking of books, though, I’ve added a widget to this page (it’s way down there) that has the perhaps incomprehensible for some of you word Wunchzettel on it. This is my Amazon.de wish list, added just in time for my birthday on Friday and, of course, Christmas coming up. It’s as much recommendations for books I haven’t read as a wish-list, though. And yeah, a lot of cookbooks up there. Because, among other things, Christmas is a rather festive season in these parts, and I wind up doing a bunch of cooking for people. And, of course, myself. Finally, speaking of food, not catering my next party (and not just because I’d want to do it myself) will be these folks. Honestly, y’all, learn the lesson of that famous American metal band Das Damen and research the foreign language you’re using first. Like what we posted for you last week? Hereâ€™s a single from THE DESPERATE BICYCLES that Iâ€™m tempted to call one of the twenty greatest of the quote-unquote punk era, â€œThe Medium Was Tediumâ€ b/w â€œDonâ€™t Back The Frontâ€. It came out near the end of 1977, and was their second 45. It was certainly meant to be a D.I.Y. call to arms, and itâ€™s hard to argue with the sentiment or its raw translation into action. I think Iâ€™m most taken with the squeaky keyboards and the strident, hectoring vocals that still sound smooth and comforting. Youâ€™d follow these guys into the trenches, wouldnâ€™t you? Many did, and left a pretty impressive legacy in & around the UK around this era. Iâ€™m back, and itâ€™s horror movie time. Unless the ground cracks open to spit fire, deadÂ birds fall from the sky for no reason, rabid dogs ravage the countryside, or any other last minute tragedy or drawbackÂ occurs, you will be seeing Earles and Jensen Present: Just Farr A Laugh Vol. 1 & 2 released on Matador Records in the very early part of 2008. Two CDâ€™s and a 50+ page book(let)â€¦. (I thinkâ€¦.Iâ€™ve lost track of its growing size) in an old-school, doublewide plastic CD case (think about the first CD issues of Miles Davisâ€™ early 70â€™s work, Coltraneâ€™s Ascension, or The Hampton Grease Bandâ€™s Music To Eatâ€¦â€¦.a much better album than the ones listed before it). On with the goodsâ€¦.itâ€™s Halloween, thus time for my annual list of entertaining horror. Day of the Dead (1985) – Donâ€™t expect thisÂ one to be remade with Hot Topic-approved jump cuts and bad nu-metal (the otherwise good Dawn of the Dead remake)Â or a GodspeedÂ YouÂ Black Emperor! soundtrack (28 Days Laterâ€¦.a horror movie for foot-shuffling hipster manwafers unfamiliar with the genre). The entire film takes placeÂ in an underground bunker, with impressive scene-chewing from all of the never-to-go-anywhere actors involved.Â This, the third in Romeroâ€™s trilogy, was even more of a â€œsocial statementâ€ thanÂ the original Dawn of the DeadÂ (1978), which can be credited as a fairly early attack on mall culture. Day of the Dead was obviously HEAVILY influenced by John Carpenterâ€™s amazing remake of The Thing (1982), a must for even those that donâ€™t care for horror.Â Later, the overratedÂ 28 Days LaterÂ would liftÂ the â€œletâ€™s do humanizing experiments onÂ the zombie in the name of science!â€ subplot from Day of the Dead. All of the (over)acting is amazing, apparently executed by actors that assumed this movie would be aÂ hit. It wasnâ€™t. Silent Night, Deadly Night 1 & 2 (1984, 1987) – Â These come together on a double-sided DVD. Donâ€™t let that confuse you, itâ€™s not that common in DVD reissues. Kudos to the first one for a genuine attemptÂ a making aÂ somewhat, eh, I donâ€™t know, â€œdifferentâ€ slasher flick, especially in 1984.Â I understand why this filmed was temporarily banned upon release (man in Santa suit killing and sexually assaulting a coupleÂ while their young son watches, etc), though the depravity plays tame compared to what qualifies as an R-ratedÂ film these days. Watch for the absurd sequence about a half hour in, when the main character (aforementioned young boy flashed forward ten years, following a long stay in a Catholic orphanage for the requisite mindfuck brutal nuns and childhood trauma)Â tries to become acclimated to life working in a toy store. Death by taxidermied deer head? Check! I have yet to watch part 2. Halloween III: Season of the Witch (1982) – I mention it every year. Please rent it. Itâ€™s perhaps the ultimateÂ WHAT-THE-F**K?!?! moment inÂ post-1970 horror. The Fog (1980) – The only case in which the PG-13 remake (recent) is possibly better than the original. So boring. Carpenter would bounce back HARD with The Thing remake,Â later settling in as the ugliest man on earth. Author kimPosted on October 28, 2007 Categories Andrew EarlesLeave a comment on Iâ€™m back, and itâ€™s horror movie time. 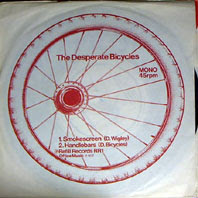 I hadnâ€™t yet heard the DESPERATE BICYCLES when I published a fanzine in 1998 that contained a long piece on the â€œForty-Five 45s That Moved Heaven and Earthâ€. Number one for me was (and remains) PERE UBUâ€™s â€œHeart of Darkness / Thirty Seconds Over Tokyoâ€; number two was (and remains) the ELECTRIC EELSâ€™ â€œCyclotron / Agitatedâ€; after that I forget. 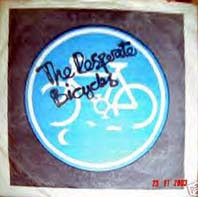 Having only heard of the Desperate Bicycles in passing within the pages of Forced Exposure magazine, all I knew was that they were punk-era progenitors of the â€œD.I.Y.â€ aesthetic, that they were excellent, and that their singles were impossibly rare. Certainly their first two 45s, now that I know & love them, would have bumped a couple of ringers off the list if I were to do it again today. â€œSmokescreen / Handlebarsâ€ came out in 1977, with both songs on one side. I have a very clued-in pal who told me heâ€™d never heard the band before, and that made me realize that I might have an opportunity to blow at least one mind by putting them up on Detailed Twang. I donâ€™t really have a ton to add about the band that hasnâ€™t been already written about here, here and here, but let me add my voice to chorus calling these masterpieces among the most invigorating & exciting rock and roll records of all time. The second 45 is even better, and thatâ€™s also coming to a computer screen near you soon. Posts will resume this weekend. Full force. 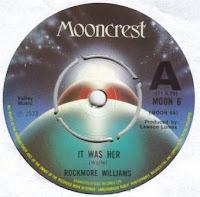 Mr. Williams, or Rockmore to his friends, unleashed these two gritty semi-Glam rockers into oblivion and probably didnâ€™t release anything else using this pseudonymâ€¦He reminds me a bit of Peter D. Kelly and Lady Rock would have certainly been more than a suitable follow â€“up to Rock To The Jukebox. 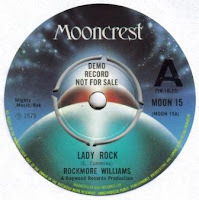 It Was Her has a neat descending horn riff Ã la Elected and you can nearly hear his medallion bouncing off his hairy chestâ€¦So who was Rockmore Williams?